Brachypodium distachyon is successfully used as a model grass species. The present study used molecular and chemical approaches to investigate the effects of the addition of the cytokinin 6-benzyladenine (BA) and two levels of gas exchange on the transcriptional regulation of lignin biosynthesis in B. distachyon. 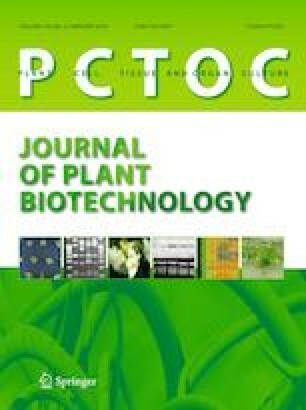 It was observed that the control of lignin biosynthesis is affected by both BA and the in vitro gas exchange rate, by sealing the vial with absence or presence of membranes. These observations are supported by anatomical and antioxidant enzyme activity analyses. However, the hyperhydricity caused by BA did not affect cell wall properties in B. distachyon. Interestingly, the CCR1 gene presented 70-fold increase in expression under the effect of BA and without membranes in addition to a significant increase in the peroxidases activity and total lignin content. Treatments with gas exchange showed higher qualitative accumulation of lignin S/G. Lignin pathway genes were transcriptionally coordinated according to the imposed treatment with apparent co-expression. Low expression of these genes was observed in the sealing treatment without membranes, while the opposite was verified in the condition of sealing with two membranes. CESA4 and CESA7 genes responded positively to gas exchange, without altering the cell wall cellulose/lignin ratio in B. distachyon. These results contribute to a better understanding of how cell wall-related gene expression is regulated by exogenous factors, as well as the many possibilities of cell wall manipulation due to its plasticity in adaptive responses. The online version of this article ( https://doi.org/10.1007/s11240-018-1506-6) contains supplementary material, which is available to authorized users. This work was supported by the Fundação de Amparo à Pesquisa do Estado de Minas Gerais (FAPEMIG) (Belo Horizonte, MG, Brazil). T.C.M.-R. was recipient of a scholarship from Coordenação de Aperfeiçoamento de Pessoal de Nível Superior (CAPES) (Brasília, DF, Brazil). Amanda Mendes is also acknowledged for the English translation. TCM-R raised the in vitro plants for the experiments and performed the experiments. TCMR, EAF, TAN and ACFC performed antioxidant enzyme activities. Cell wall isolation and lignin/cellulose content determination, and lignin hystochemical analyses. DSB and TCM-R performed statistical and gene expression analyses. TCM-R, DSB, TAN, EAF, MGCC and WCO designed the research, interpreted the data and wrote the paper.